Congressional Republicans and Democrats reached agreement on a bill funding the federal government through September 30. Congress is expected to approve the $1 trillion spending bill later this week. Without congressional action, some American government operations would stop and many federal employees would be forced to stay away from their jobs. The bill sets spending levels for U.S.-based programs, such as medical research, education and environmental protection. It also sets spending levels for foreign aid. For example, the bill would provide $990 million to aid the international response to severe food shortages mostly in Nigeria, South Sudan, Somalia and Yemen. Almost $7 billion would go to programs that assist refugees and others displaced by conflict. Another $100 million what fund what members of Congress say is countering Russian influence in Europe and South and Central Asia. The bill would also provide $358 million for international antiterrorism programs. That includes efforts to cut financing for terrorist groups, improve border and airport security and keep materials used for weapons of mass destruction from terrorists. The bill also provides over $6 billion to address security needs at 275 American embassies and diplomatic offices around the world. The budget bill accepts some proposals of the administration of President Donald Trump, but not others. For example, it does not provide money for a wall along the United States border with Mexico. The bill also does not fund a request from the administration to employ additional immigration control officers. 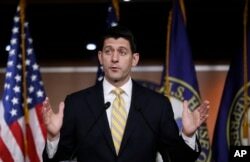 But congressional Republicans said the bill would provide a $1.5 billion “down payment” for improved border security measures proposed by the Trump administration. However, the bill would raise spending on the U.S. military, as Trump requested. The increase provided in the bill would be $25 billion over the 2016 budget, House Republicans reported. The bill includes some cuts in international aid requested by the Trump administration. For example, it would cut aid to the United Nations and other international organizations by $640 million. There was no immediate comment by UN officials about the effect of such cuts on its operations. Republicans and Democrats in Congress negotiated the legislation. Vice President Mike Pence appeared on “CBS This Morning” Monday to say that President Donald Trump supports the bill. Senator Charles Schumer of New York leads Senate Democrats. He also praised the spending agreement. He said, “This agreement is a good agreement for the American people, and takes the threat of a government shutdown off the table.” He said the bill removes some proposals opposed by Democrats, such as an “ineffective” wall along the Mexican border. Senate Democratic Leader Chuck Schumer, right, with House Minority Leader Nancy Pelosi and Congressman Hakeem Jeffries, at the U.S. Capitol. 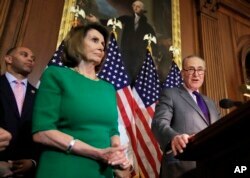 But the bill would increase spending for programs important to middle class Americans such as medical research and education, Schumer said. Congressman Paul Ryan of Wisconsin leads Republicans in the House of Representatives. He holds the powerful position of Speaker of the House. House Speaker Paul Ryan speaking at the Capitol last week. Under the bill, some American foreign aid would come with conditions. For example, the bill would withhold aid to Pakistan unless the government cooperates with the U.S. to fight terrorism. Aid to Egypt would require its leaders to continue its current partnership with the U.S. and continue the nation’s peace treaty with Israel. The bill also places conditions on continued U.S. aid to the Palestinian Authority. The group must show willingness to take steps to reduce violence against Israelis. Parts of the legislation are aimed at China. One measure would ban processed poultry from China from being used in the United States Department of Agriculture’s school meal program. The bill also includes funding to cover costs to New York City and Florida for security for President Trump and his family. Trump’s wife and son have remained in New York City so the son could complete the school year at a city school. Bruce Alpert reported on this story for VOA Learning English based on reports by the Associated Press, Reuters, and budget documents released by Congress. Mario Ritter was the editor.